More of the backpieces associated with some of the family photographs passed down to Ron Lawson. 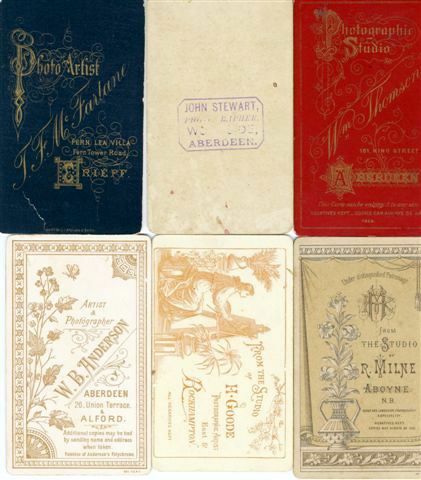 T.F.McFarlane, Fern Lea Villa, Fern Tower Road, Crieff; R.Milne, Aboyne; H. Goode, Rockhampton, Australia; Wm Thomson, King Street, Aberdeen; John Stewart, Aberdeen, and W.B.Anderson, Aberdeen and Alford. I have an old photograph by R Milne of Aboyne, can you help me to date it? I will give it a go Richard, and if I can't, I know someone who specialises in dating old photographs. Could you send a copy to the website email address as shown on the introductory page please?